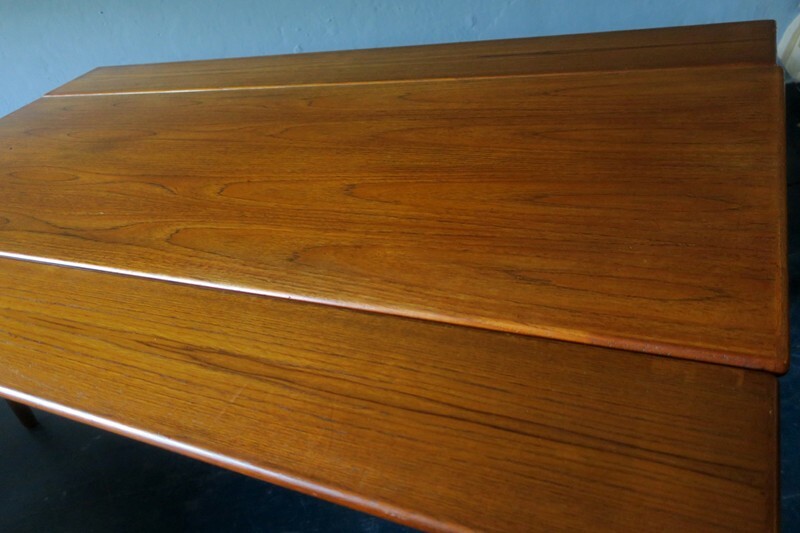 Kai Kristiansen large metamorphic 'elevator' table in teak, dating from about 1960. The table is unusually large with a length of 150 cm as opposed to the standard 120 cm. The table can be extended by means of two leaves from 150 x 54 cm to its full width of 150 x 91 cm. It can also be raised from coffee table height of 53 cm to make a dining table of 67 cm height. Very good vintage condition with minimal signs of age and use. Owner Gerry Mohan has a wonderfully quirky shop in Berlin, Germany's capital and a vibrant destination. When he found his shop, with only four rooms, back in 2010/11, it was apparently very much in need of bringing into the 21st century, but Gerald decided to keep it interesting and simply tore down the wallpaper to reveal the aged and appealing worn look walls. Today he still displays against this backdrop, his mid-century array of Danish, Italian, German and English tables, chairs, sofas and lamps, all stacked up to the ceiling. Our advice is take a trip to Berlin, never a boring destination, to visit this quirky shop and enjoy some German hospitality. Opening hours are Wednesday to Friday, 3pm to 6pm, other times by appointment.